The Mafia de Cuba experience is uneven. Like most board-games, the fun you have depends on what you and your fellow players can make happen with what’s in the box. Comparatively few titles though make that a formal game mechanic. When everything aligns, and that happens more often than not, it’s a great experience. Just be aware that your mileage is very much going to vary and individual game sessions may fall flat as a result. We gave it three and a half stars in our review – it’s a good game overall, and we’re glad to have had a chance to play it. What about you? Will you have a chance to play it? Let’s find out if this teardown ends with a warm embrace, or a menacing kiss upon two cardboard cheeks. First I need to know though – are you wearing a wire? FRISK THEM, BOYS. 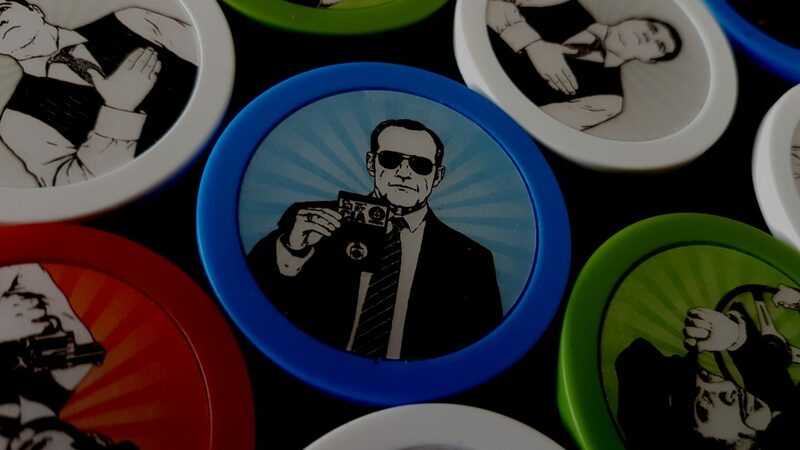 The cleaner and driver token rims will be difficult to differentiate for some people, and the driver and FBI rims for others. Each token though comes with different artwork on the front and as a result this isn’t a problem. Diamonds, as you might imagine, are completely fine. One small consideration here is that you’re not going to be looking at the box with neatly arranged pieces. You’re going to be looking at a jumble where things are lying on top of other things. As such, telling at a glance what is left and what has been taken can be a little bit difficult. That also doesn’t really matter because you are permitted as much sifting and sorting of the contents of the box as you need to satisfy yourself of its contents. There is, I suppose, a theoretical possibility that the need to do so might leak some game information based on the knowledge of a player’s colour blindness. I don’t think that’s likely or even necessarily useful. We strongly recommend Mafia de Cuba in this category, although there’s no reason the colours chosen couldn’t have been drawn from a colour sensitive palette so as to avoid even these minor issues. There are major problems here for those where total blindness must be considered. A player is certainly going to be able to know how many diamonds are in the box – that’ll be obvious from touch. What they’re not going to know is which roles are which, and which roles are available to select from. They’ll know how many roles remain to be taken, but not which ones are gone. That by itself renders the game entirely unplayable unless someone has a sighted player not otherwise involved in the game to tell them the contents of the box. In that case, our analysis becomes dramatically more positive. For those with less severe visual impairments there are still likely going to be issues with ascertaining roles in the box but those issues depend on the extent to which close inspection will reveal the status of chips to the player. 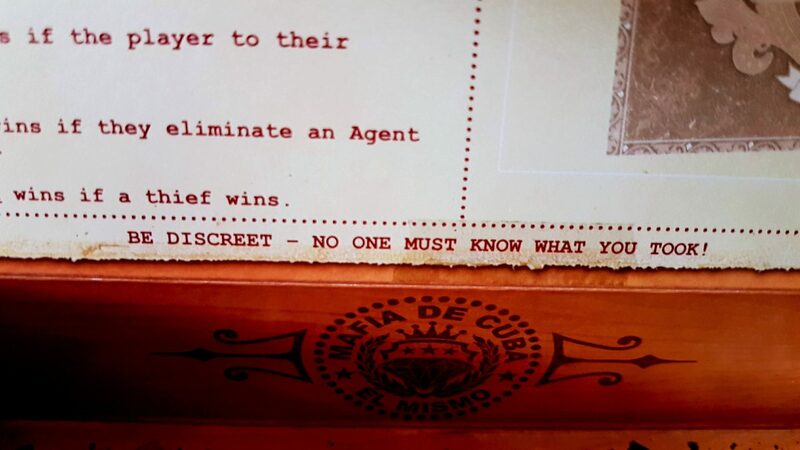 The design of Mafia de Cuba means that you’re often looking into a box in conditions of relative privacy, and all that your close inspection would reveal to other players is that there are things in the box to inspect. That’s information that is both obvious to the previous and next players, and useless to players later in the selection order. By the time a box gets to them its state will be radically altered. 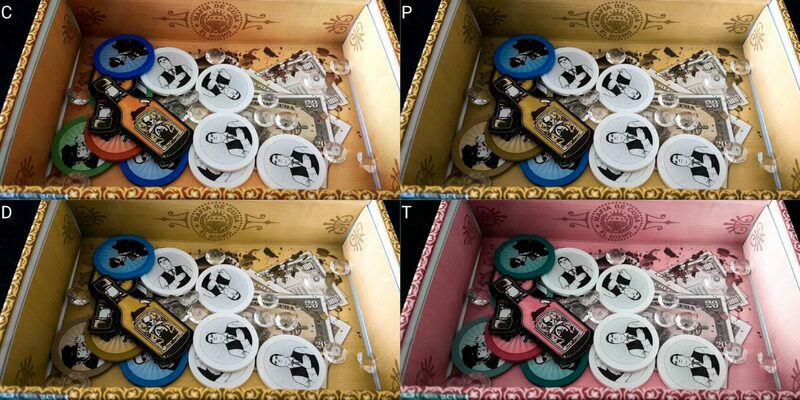 However, the investigation of the contents will need to be done inside the box – you can’t just take tokens up close to your face and check because everyone else will see them. If these issues can be resolved, the game becomes fully playable because like the Resistance it’s one of discussion and logical deduction. Visual information beyond body language (which is an unreliable source of information as best) is not incorporated into play. One of the game players sits out a round so as to tell a VI player what roles are available. The role of the VI player is determined by the token placed in the bag by the first player, and that they can secretly indicate this to the appropriate individual. The VI player adopts roles based on a previously determined formula. The VI player always adopts a loyal role, or the VI player is always the cleaner. These are just suggestions, and they don’t fully resolve the problems. In some of these cases, a visually impaired player would not be able to offer useful information as to what roles were left in the box when it came to them. The good news is that I think that might even make the game more interesting. It adds a veil of shadow that players can use to add an additional level of obfuscation to proceedings. I confess I haven’t tested the game in this way, but my gut (which is substantial) tells me that it’s workable. We’re going to tentatively recommend Mafia de Cuba in this category because I think you can house-rule a variant that maintains the feel of play while ensuring a meaningful aspect of role selection is maintained. You’re going to be quizzed on all of those by the Godfather, and any deviation from a consistent set of answers will create a pall of suspicion. The Godfather might be willing to be lenient here to help reduce the stress associated with interrogation but that in itself creates an imbalance in play that others could exploit to their own benefit. Over enough games too it’ll become increasingly difficult to remember how many diamonds you saw in this iteration versus how many you saw in another. Then, like with almost every social deductive game, you need to remember what people claim they are and what they claim to have seen as the box made its way around. On to that you’ll need to layer a kind of ‘truthiness’ to their claim based on how it corroborates, or contradicts, other information presented by other people. Everyone needs to do this, not just the Godfather, because their winning scenario is tightly coupled to how others present themselves. The loyalists for example want to make sure the Godfather is getting good information all the time. This mental map of theft and larceny is going to shift from minute to minute, and then be radically reshuffled between games. The memory burden here is intense and each player represents a payload of intersecting elements, all of which may be important as you attempt to identify exploitable discrepancies. For those with fluid intelligence impairments, the story is a touch more positive but not enough to bring the game into the neighbourhood of a recommendation. You’re still going to be attempting to follow through a chain of evidence with moving parts and ever shifting reliability. Coupled to that, unless you are a thief your win condition is linked to the win condition of someone else. Your actions at the table in that case are going to need you to work out whose agenda you need to be advancing. If you’re a loyal hencher then you can trust the Don, but you can’t necessarily trust anyone else. You can simply tell the unvarnished truth and not try to do more. That though leads to a very passive role where you don’t get to do much except say ‘These are things I know to be true’. Part of the fun here is identifying who has what horse in what race, and then making sure you thwart them to your own advantage. One thing I do love here though is that the rules and roles are prominently displayed on the flap of the cigar box so that when your turn comes around you don’t need to stare in bemusement as you try to remember what you’re doing. It tells you right there in a way that obscures your confusion from the table. It’s very nice. It’s great too that players can self-select their role, and it’s certainly the case that even those with relatively severe impairments in fluid intelligence will be able to participate. However, participation is different from playing and we don’t think that’s likely to be satisfying enough for anyone. We don’t recommend Mafia de Cuba in either of our cognitive accessibility categories, with our strength of feeling being considerably more intense when it comes to memory considerations. One Night Ultimate Werewolf and the Resistance put a huge emphasis on players being able to lie well, and read truth into the lies that people tell. Mafia de Cuba doesn’t emphasise that to nearly the same extent. In the Resistance there are loyalists, but they don’t know anything. In Mafia de Cuba there are loyalists and they know what they received and what they passed on. The Godfather too knows how many loyalists are out there, and that hugely influences the extent to which players must rely on emotional intelligence for effective play. Mafia de Cuba isn’t entirely a logic game – there are too many question marks over all the information you have, but I would say it emphasizes deduction far more than it does social. The fact that there are points of reliable honesty is useful. That they also come with genuine information can open the game wide open. The self-selection of roles in Mafia de Cuba also opens up play even for those for whom lying and deceit are difficult, or impossible. They can grab a loyalist token, or a driver, or the cleaner. They can just say straight up what they took and what they saw. It changes something of the puzzle of the game for everyone around the table, but it’s a bit like internet traffic and censorship – the social context will route around it. Mafia de Cuba comes with an emergent meta-game that grows and changes over many sessions. Part of that meta-game can be ‘X never lies’ and in compensating for that the game will still be fun. The usual situation of people telling you that you’re lying, or catching you out in a lie will prevail here. However, there are few incentives for players to gang up on others because it’s not a game of hidden allegiance and group obfuscation. There aren’t sinister agents at the table collaborating to make someone look guilty. There are some people that win if the honest truth comes out (in which case, a convenient lie isn’t helpful) and others that are out for their own self-interest. You’re never the target of a secret conspiracy here, and that alleviates many of the emotional issues that we have seen in other similar styles of games. And more than this, because games of Mafia de Cuba are self-contained, the cost of screwing up is only paid during an individual session. This isn’t like the Resistance where making a mistake might cost multiple people the game, and deny you the fun of participating in future missions. Here, there’s player elimination but watching how your elimination alters the dynamics of the table is interesting in and of itself. 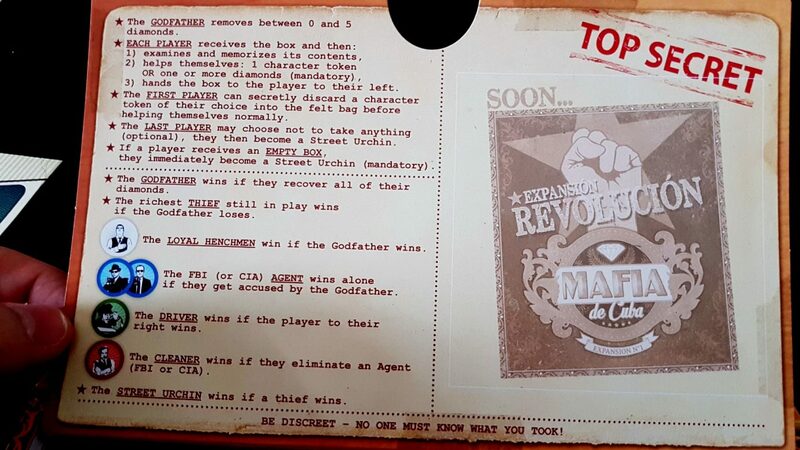 The game rules say that eliminated players can no longer talk, but since it’s entirely possible for a game of Mafia de Cuba to drag on I’d be inclined to relax that requirement. Use the model of Deception: Murder in Hong Kong. We’ll recommend Mafia de Cuba in this category. This is a massive problem area that either ruins the game entirely for people with physical accessibility issues of a certain kind, or adds an inconvenient time burden to everyone during the setup. 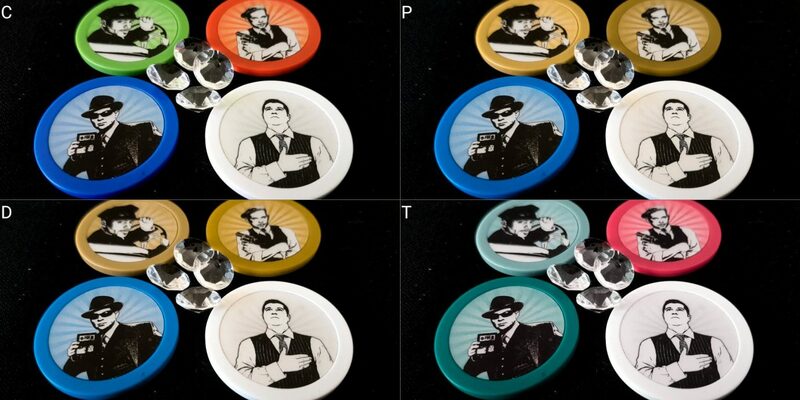 The extent to which your group is enthusiastic to play will determine which is which. Gather up one or more diamonds if you’re going to steal them. That’s tricky for those with fine motor control problems. Gems tend to accumulate in the corners of the box. And then you place what you picked up in 2 or 3 in your pocket (or other secret place) without anyone knowing what you took. It’s that need for secrecy that really messes up the accessibility of this section. If you’re gathering up diamonds, people will hear it as you scrabble against the sides. If you’re picking up a token, they’ll hear that too and also know that’s what you’ve gone for by the absence of scrabbling. You need to add genuine sleight of hand to the procedure so as to obscure what you took. Pick up a role while also rifling through the diamonds. Drop one of the tokens while selecting from several. Shake the box while you make your choice. All of these work, sort of, but they don’t work completely and they all require a degree of multitasking and precision of movement. Those for whom hand and arm control is a factor will likely find this very difficult, even leaving aside the task of furtively secreting your selection somewhere nobody can see. If you’re the first player to take the box after the Don has set it up, you also have the additional complexity of perhaps placing a token into a bag and then hiding that away without anyone seeing its contents. This will be fine for some categories of physical impairment – a walking restriction for example is not going to impact upon it. For everyone else, the act of selecting a token is going to reveal to the table whether you are a thief, and the information collectively present in the heads of everyone else will likely uniquely identify the specifics. There is a solution to this, but it adds time to an already lengthy process – have the box in a separate room and let everyone pick from it in turn. That ensures secrecy of selection but whether or not that’s an appropriate solution depends on what kind of time-restrictions you work within. If a player with physical accessibility concerns is unable to conveniently make the trip to another room, even that won’t actually fix the problem unless you invert and have everyone leave the room. Beyond this aspect of play, there are no real physical accessibility problems other than turning out your pockets. That can be dealt with by using a cup or other opaque container and permitting its contents to be revealed at the appropriate time. So yes, there is a solution but that solution is cumbersome and inconvenient and as such we don’t recommend Mafia de Cuba in this category. The communicative burden put on players here is less intense than it is in many of these games. You’re not engaged in a negotiation – you don’t need to convince people to follow a play or engage in a strategy. You’re just trying to convince them you’re telling the truth, or deliver a convincing lie. The lie too won’t need complex linguistic gymnastics or careful eloquence. You’ll be asked by the Godfather what you saw and what you took, and you’ll be answering that while the rest of the table is quiet. There will certainly be moments of engaged and lively discussion, but this isn’t a game where everyone is trying their damnedest to talk over everyone else. There’s a lot more room for people to take their time, articulate clearly, and consider their responses. That doesn’t mean it gets an unambiguously clean bill of health here – it’s still a game that is primarily driven by discussion, and as such it definitely favours those without communication impairments. It’s just the expectation is lower, and the sophistication of the discussion somewhat less intense. We’ll offer a tentative recommendation. The only woman in the game is on the box, and she’s not even present as one of the roles. She comes in an expansion pack. Her inclusion wouldn’t have got a good hearing anyway since she is the ‘diamond lover’, which is basically just a lazy invocation of the ‘women love jewellery’ trope. She doesn’t have a meaningful identity in the game, or an interesting motivation. Sure, the world of the mafia is not necessarily one for a women except of course for all the incredibly powerful women crime lords that have run organisations either openly or behind the scenes. Gertrude Lythgoe, for example or Marllory Rossell. Or Rosetta Cutolo if you want to go back to a period of organised crime appropriate to the 50s setting of Mafia de Cuba. The manual at least doesn’t default to masculinity, and adopts gender neutral pronouns throughout. And the game does offset some of its gender balance issues by being explicitly about the Cuban mafia when the Italian/American mafia would have been an easier choice. 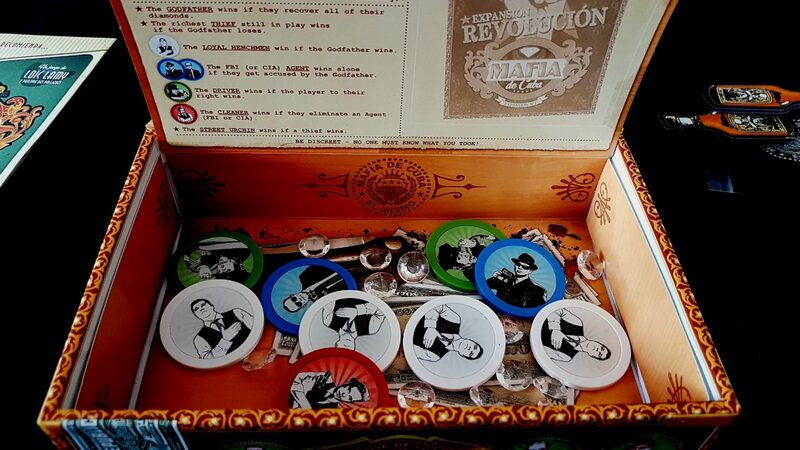 Mafia de Cuba has an RRP of £30, which is astonishingly high for something you could easily make yourself with a few pieces of paper and a handful of coins. The production values are good, but they’re not reflective of the meaningful elements of the game. I picked it up for £10 at the UK Games Expo though, so I suspect there is a fair degree of violent volatility in the pricing. I couldn’t at all recommend it at its full retail price but if you find it on sale you should definitely consider it. Its main problem here is that it requires an absolute minimum of five players, and isn’t particularly recommended at that count. Its key benefit is that it plays up to a ludicrously indulgent twelve players and works well from seven players onwards. It terms of arranging a large game night, there aren’t many games that can equal its blend of fun and flexibility. We’ll tentatively recommend Mafia de Cuba in this category. Intersections of physical and visual accessibility considerations will almost mandate either a player acting on behalf of another, or the adoption of the ‘two rooms’ system of private interaction. Once you get past the setup the game should be playable without further concern, but there’s a fair amount you need to remember, and a lot you need to do secretly. You will likely need privacy to do it under those circumstances. Given the number of players required and supported by Mafia de Cuba, this might in itself represent an accessibility problem for those with emotional control issues. It’s easy to become impatient waiting for the fun to start, and Mafia de Cuba already has quite a poor ratio of setup to play. Individual games of Mafia de Cuba last between ten and twenty minutes (barring accessibility compensations) but the attention is not spread equally. Playing the Godfather is an intensive job, but it’s also quite demanding to be the target of repeated interrogations. On the other hand, occasionally you’ll just pass muster right away and not be engaged and involved in the rest of the game. That’s good for limiting issues of exacerbated discomfort, but not so good for keeping everyone focused on what’s happening. Some players will be keenly interested in what other people are saying. Others don’t have any particular stake in any conversation that doesn’t directly involve them. Intersections of cognitive and emotional accessibility may result in players finding it difficult to keep focus. As with many games in this genre it cannot be assumed that players at the table are incentivised to offer accessibility support – sometimes a mistake on the part of one player is just exactly what you need to get out of your own trouble. Loyalists though are incentivised to be collegiate once they are reasonably well known, and players to a certain extent to get to self-select how combative their win condition is going to be. As such, the extent to which this is a problem is going to be at least partially self-defined. Given the fact this is a game about building and sustaining credibility, it’s not possible for someone to drop out of a game or sub in for someone else. The impact on the dynamic of the table would be considerable, and as such it’s likely better to abandon that game and set up for a smaller player count. The cost of that is in the down time rather than the invested time – as discussed above, an individual session of Mafia de Cuba might only be ten minutes long. That can be matched or even exceeded by the setup depending on how long people take and the exact form adopted by the provision of privacy. 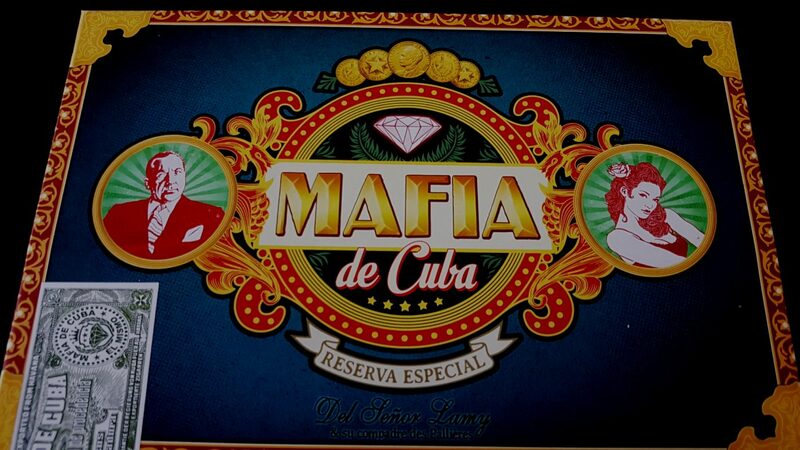 Mafia de Cuba is a game that combines logical deduction and social obstruction, and it easily plays counts of which most games can only dream. It also, like almost every social deduction game, has a whole host of design consequences that make recommendation difficult in an accessibility teardown. Having discussed the Resistance, it’s actually interesting to go between the two and see what impact the change in design elements has on the overall profile. The Resistance is very much more physically accessible. Mafia de Cuba is more emotionally accessibie. The Resistance dominates in the socioeconomic stakes, whereas Mafia de Cuba is the stronger performer when it comes to communication requirements. While they seem similar kinds of game, the different emphasis they put on different parts of the design space has a very noticeable impact. We gave Mafia de Cuba three and a half stars in our review, and it’s so adaptive at different player counts that we’d be inclined in general to recommend it in addition to other games in the same rough design niche. Its accessibility profile means though that recommendation has to come with a whole pile of caveats and conditions. As such you should be mindful of the implications here before you decide that a dangerous diamond heist deserves a place on your shelf.